Стационарная индукционная петля с усилителем предназначена для оснащения помещений (зон в помещениях) площадью до 200 м2, монтируется особым образом в пол либо потолок помещения и коммутируется с усилителем, расположенным в непосредственной близости от петли. Предназначена для оснащения помещений (отдельных зон в помещениях) площадью до 100-200 м2. громкой связи и другим источникам сигнала. Более 10% населения страдает от нарушения слуха.Фирмы предлагающие товары или услуги должны сделать "разумные" изменения, что-бы их услышали. Самый простой способ это создание портативной индукционной системы.. Звуки передаются на индукционную систему и усиливаются с помощью слуховых аппаратов. Большинство слуховых аппаратов имеют "Т" или "MT" переключатель, который позволяет им подбирать частоту электромагнитного сигнала, генерируемого системой цикла индукции. Слуховой аппарат преобразует этот сигнал в звук и позволяет им более полно участвовать в общем разговоре, заказе товаров или услуг и т.д. Принцип действия прибора вот такой же как на картинке , только вместо телефона - микшерский пульт, который вы видите в чемодане, а петля огромная на весь демонстрационнный зал , охватывает одновременно сотни человек. Упрощенный принцип действия, петля вокруг зала. 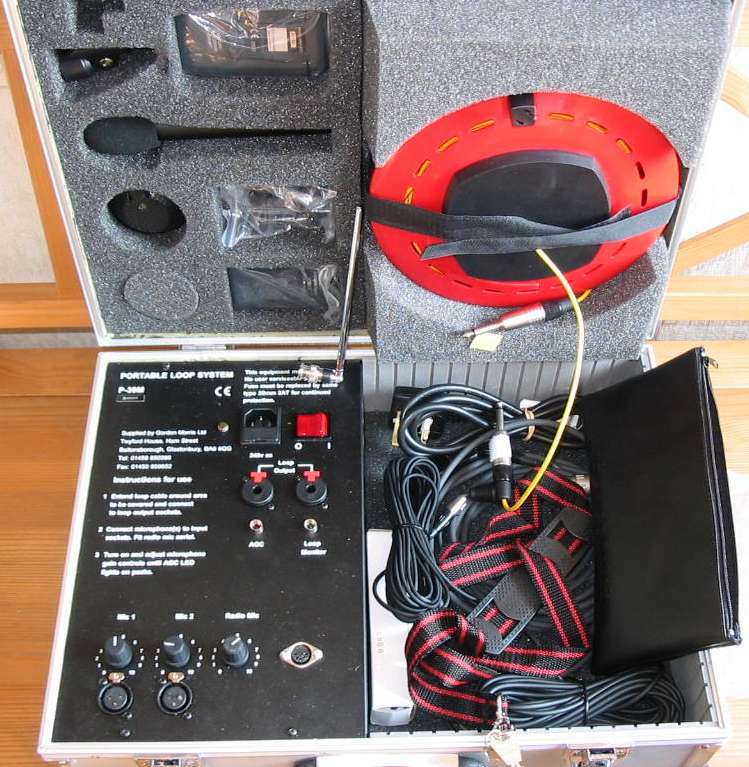 Portable loop system especially suitable for medium sized meeting rooms up to 70 sq m. Any number of hearing aid wearers within the looped area can benefit from the system. 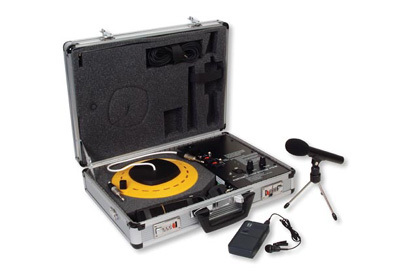 This mains powered loop is housed in a strong durable carry case with a built-in amplifier and a reel of loop cable. 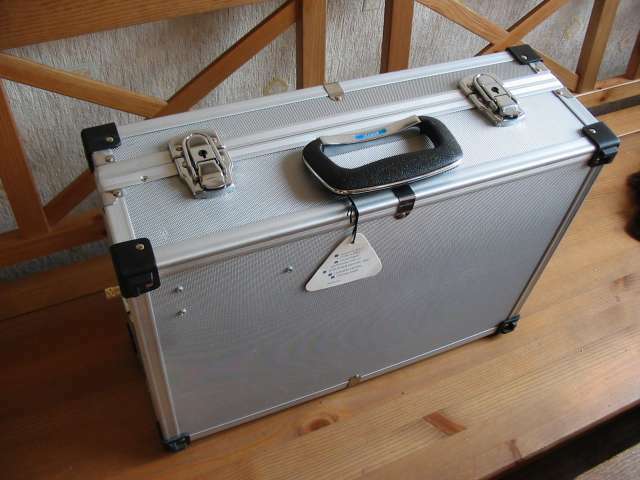 This system is supplied with one hand held and one radio microphone. There are other options in this range with different choices of microphone. это фото более слабой модели, но похоже. Микрофон проводной Electret Wired Video camcorder microphone. What is a Tele-coil, Loop System or Induction Coil? An induction loop system is a loop of wire that is installed around the perimeter of a listening area and it emits a magnetic field. The loop receives its input signal from a sound source such as the public address system in a theatre, church or other public venue. Most modern hearing aids are compatible with loop systems. Compatible aids feature a ‘T’ switch. With the switch set to the ‘T’ position the wearer can hear the sound source directly via the loop, bypassing the hearing aids microphone. Where do I find loop systems? Venues that provide a loop system display the “Ear” symbol. Many public buildings are wired with loop systems. Sometimes loops systems are not turned on or are broken, so you must ask if you are unsure. If you are not certain, try switching your aid to the ‘T’ position. If your hearing improves, it is picking up the loop system. If you hear a buzzing sound or a wind-like noise, then there is no loop system working. 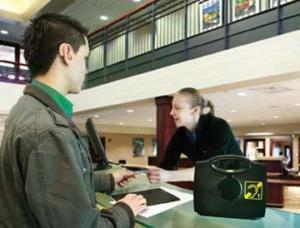 You will find loop systems in many public buildings and on some telephones. Some people have them installed in their own homes. Some telephones will often specify it is “Hearing Aid compatible,” which indicates it will receive the loop signal. For information on loop system availability at popular venues all over NZ just consult the venue listing here. Is my hearing aid compatible with a loop system? Most modern hearing aids are compatible with loop systems, or can be made compatible. You will need a ‘T’ switch option on your hearing aid. If you are not sure ask the staff at Hearing Consultants. Some hearing aids have an ‘MT’ option, which means the wearer has the best of both worlds, hearing via the microphone and via the loop system simultaneously. 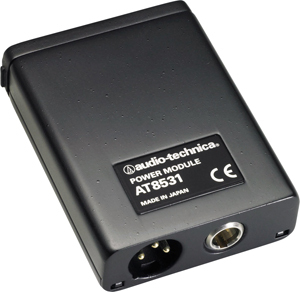 The Audio Technica AT8531B is an in-line body-pack power supply for AT series gooseneck and overhead microphones. The unit is designed to supply 9 to 52V phantom power and uses AA batteries. A low frequency roll-off switch is provided and minimizes structure and wind noise and a belt clip provides added stability. The unit features a TB3-male input and standard 3-pin XLR-male output connector. 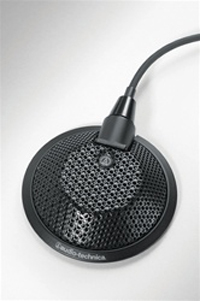 The Audio-Technica U841A is an omnidirectional boundary microphone designed for highly intelligible sound reinforcement, professional recording, television and conferencing in surface-mount applications. The microphone's omnidirectional polar pattern is capable of accurately reproducing audio at 360 degrees. The surface mounted U841A features a polarized condenser element that reproduces audio with crisp detail and pristine fidelity. UniGuard RFI-shielding protects against radio frequency interference. The microphone is powered via phantom or 1.5V AA battery power, an external in-line phantom power supply is included. The U841A is an excellent choice for capturing conferences, meetings, broadcasts, performances, ambiance and more. Такая же система только в мини исполнении. PDA Диапазон. Портативная Индукционная петля - поможет удовлетворить потребности Акта о дискриминации инвалидов, BS8300 и Закон о нормах в помощи. Она была разработана и изготовлена в Великобритании. Более 10% населения страдает от нарушения слуха. Акт о дискриминации инвалидов любого государства, предлагающие товары, оборудование или услуги для общественности должны сделать "разумные" изменения, что-бы не носили дискриминационного характера в отношении инвалидов. Самый простой способ выполнить это требование является создание портативной индукционной системы, которая доступна в любое время. Звуки передаются на индукционную систему и усиливаются с помощью слуховых аппаратов. Большинство слуховых аппаратов имеют "Т" или "MT" переключатель, который позволяет им подбирать частоту электромагнитного сигнала, генерируемого системой цикла индукции. Слуховой аппарат преобразует этот сигнал в звук и позволяет им более полно участвовать в общем разговоре, заказе товаров или услуг и т.д. Система проста в использовании, создает цикл прослушивания области около нескольких метров. Система совместима со всеми видами NHS средств и любыми другими слуховыми аппаратами с T (катушкой) коммутатора. Целесообразно для школы, магазинов, домов престарелых, развлекательных центров, гостиниц, банков, докторов хирургии, рецепции и многих других частных, государственных и гражданских применений. 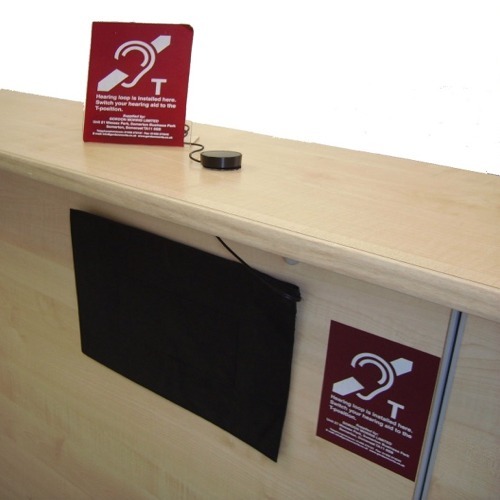 Across the counter communications system to assist the hearing impaired customer. System 1 includes a 13A boundary microphone and a Univox DLS-70 amplifier. The Uni 70 has a discreetly placed microphone and loop pad and can even be used through security glass. 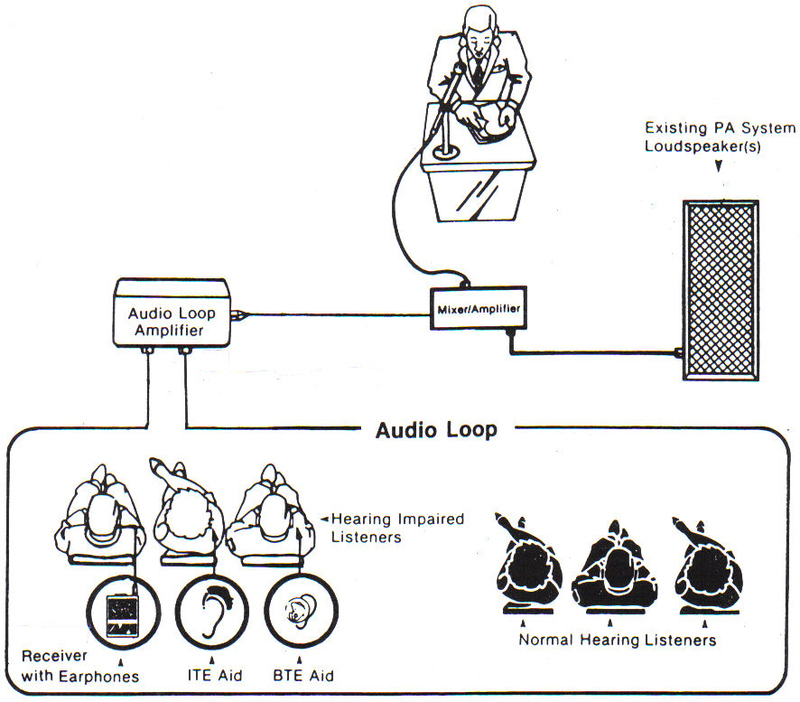 The system enables a number of hearing aid users to listen to speech from microphones, radio, and television. 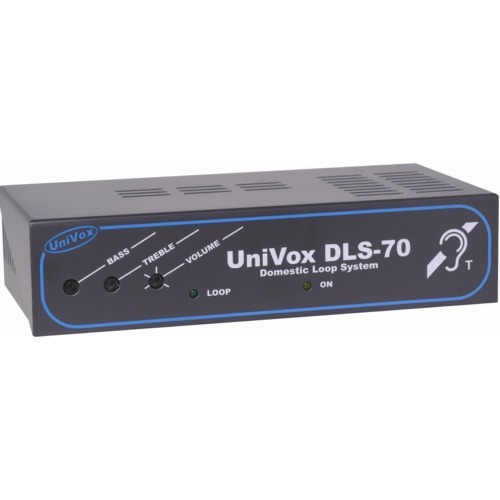 The UniVox DLS Hearing Amplifier series of induction loop amplifiers have been designed for use in smaller locations for hearing aid users, such as reception areas and waiting rooms. When the hearing aid user demands stability and reliability from a hearing amplifier, the Univox DLS 70 will deliver even in difficult and challenging environments. This results in your hard of hearing customers being more satisfied through better hearing; reflecting better customer services, communications and sales for you. This hearing amplifier system covers an area of 70m². The loop amplifier system enables a number of hearing aid users to listen to speech from microphones, radio, television, hi-fi and live performances. With its built-in monitor it is easy to check and maintain excellent sound quality. Univox microphones have been specifically designed to work with Univox amplifiers to give the best quality sound possible. 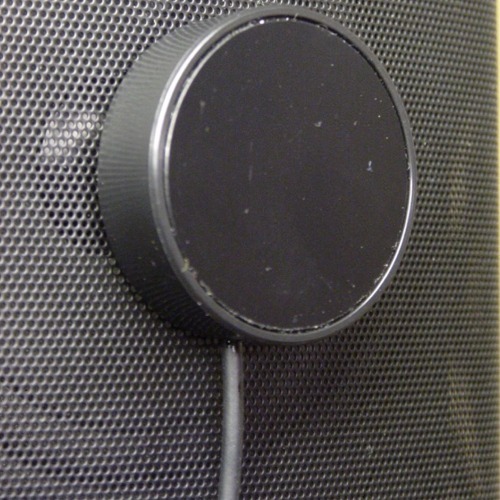 This discreet boundary layer omni microphone can be used for across the counter system and TV speakers. All power is delivered through the microphone output on Univox amplifiers, thus eliminating the need for external batteries. All are Electret condenser microphones designed to work with Phantom Voltage (1.5V). Five years’ expected battery life under normal operating/charging conditions. Mono stethoset receiver receiving 2.3MHz (Ch.1). 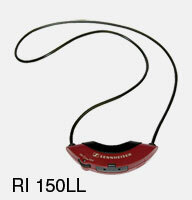 RI 150LL has an integral neck induction loop for the hard of hearing. Wideband distribution systems can offer high quality audio for music or speech distribution over a large area for uses such as hearing support systems or audio commentary in auditoria. A variety of radiators and receivers are available depending on the application. Full manufacturers details and technical specifications available on request. An alternative to an induction loop system is an infrared system. Infrared systems are used when confidentiality is an issue, adjacent rooms are to be installed, a multi channel system is needed i.e. 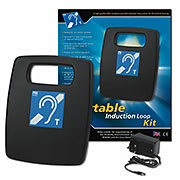 for hearing impairment support and translation, easy portability or an induction loop simply can’t be installed for technical or financial reasons. Infrared systems use invisible infrared light to carry the sound to wearable receivers. 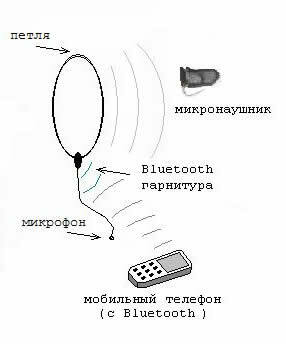 There are two types of receivers, a stethoset which convert the infrared light to audio and a neck loop which convert the infrared light to a personal induction loop. Each receivers has a rechargeable battery pack which can be easily charged in charging racks. The infra red light is transmitted by infrared radiators (shown above). These radiators are available in a number of different models depending on the distance and area to be covered.